Music has always been a part of human civilization. Therefore it is quite logical for the consumers to demand multimedia features in there phones. Realizing this, founders of J2ME have developed the Mobile Media API (JSR 135). They have tried to give us an easy to use yet powerful API for developing applications involving multimedia. Mobile Media API helps us in playing and recording sounds and video. In fact no good game can be complete without the use of Mobile Media API. Even businesses will over the long run be using this API in a variety of ways. In this section we will discuss the classes and interfaces of Mobile Media API in detail. The Controllable interface provides us the methods for obtaining the Controls from an object like a Player. It provides methods to query all the supported Controls or to obtain a particular Control. This method returns the collection of Control objects supported by the implementing object. This method returns the object that implements the control. If the object does not implements this particular Control then it returns null. · Synchronization with other Players. This field indicates the state of the Player. It indicates that the Player has not acquired the required information and resources to function. This field indicates the state of the Player. It indicates that the Player has acquired the required information but not the resources to function. This field indicates the state of the Player. It indicates that the Player has acquired all the resources to begin playing. This field indicates the state of the Player. It indicates that the Player has already started. This field indicates the state of the Player. It indicates that the Player is closed. This field stands for the returned value indicating that the requested time is unknown. This method constructs portions of the Player without acquiring the scarce and exclusive resources. This method may take some time to complete. This method acquires the scarce and exclusive resources and processes as much data as necessary to reduce the start latency. This method starts the Player as soon as possible. This method Stops the Player. This method pauses the playback at the current media time. This method releases the scarce or exclusive resources like the audio device acquired by the Player. This method will close the Player and release its resources. This method sets the TimeBase for this Player. This method returns the TimeBase that this Player is using. This method sets the Player's media time. This method returns the current media time in microseconds or this method will return TIME_UNKNOWN. This method returns the Player's current state. This method returns the duration in microseconds or the TIME_UNKNOWN field. This method sets the number of times the Player will loop and play the content. This interface helps in receiving asynchronous events generated by Players. To use this interface the applications have to implement this interface. They should then register their implementations with the addPlayerListener method in Player. This field is posted when a Player is stopped as responding to the setStopTime call using the StopTimeControl. This field is posted when the duration of a Player is updated. This field is posted when the size of the video is changed either because the source video size or the display size has changed. This field is posted when an error occurrs. This field is posted when the recording is started. This field is posted when the recording is stopped. This field is posted when an error occurs during recording. This field is posted when the Player enters the buffering mode. This field is posted when the Player leaves the buffering mode. Whenever an event occurs this method is called to deliver an event to a registered listener. The TimeBase interface defines an interface for a constantly ticking source of time. It measures the progress of time in microseconds and provides the basic means for synchronizing media playback between different Players. This method returns the current TimeBase time in microseconds. The Manager class is the access point for obtaining system dependent resources such as Players for multimedia processing. Manager class provides an access to the implementation specific mechanism for constructing Players. Manager class can also help us in generating simple tones directly through its playTone method. This field stands for the locator to create a Player to play back tone sequences. This field stands for the locator to create a MIDI Player which gives access to the MIDI device by making MIDIControl available. This method returns a new Player. This method plays back a tone as specified by a note, its duration and volume. This method returns the system time base. This exception indicates an unexpected error condition has occurred in a method. This exception is specifically related to the Mobile Media API and its contents. This constructor constructs a MediaException with null as its error detail message. This constructor constructs a MediaException with the specified detail message. This Control is the interface to control the precise positioning of a video frame for Players. Frame numbers for a bounded movie must be non-negative and should generally begin with 0. This interface provides us with seek and skip facililty. This method is to seek a particular frame. This method returns the actual frame that the Player has seeked to. This method is used to skip the given number of frames. It returns the actual number of frames skipped. This method returns the converted media time in microseconds for the given frame. If the conversion fails -1 is returned by this method. This method returns the converted frame number for the given media time. If the conversion fails -1 is returned by this method. GUIControl extends Control interface and is defined for controls that provide GUI functionalities. Controls that support a GUI component should implement this interface. Currently only VideoControl extends this interface. This field defines a mode on how the GUI is displayed. This method is used for initializing the mode for GUI display. This Control is used to retrieve metadata information included within the media streams. An object implementing this interface recognizes and stores metadata and provides XML-like accessor methods to retrieve the metadata information. This field stands for the Default key for AUTHOR information. This field stands for the Default key for COPYRIGHT information. This field stands for the Default key for DATE information. This field stands for the Default key for TITLE information. This method returns the list of keys for the available metadata values. This method returns the value of the key or null if the given key is valid but the value is not yet available. This Control provides access to MIDI rendering and transmitting devices. Internal synthesizers or external hardware ports are some of the common devices that are controlled with MIDIControl. This field stands for the Command value for Note On message. This field stands for the Command value for Control Change message. This method returns true if this device supports querying of banks. This method returns program assigned to channel in form of an int array. This method returns channel volume. The returned value ranges from 0-127. The returned value may be -1 if it is not known. This method sets program of a channel. This sets the current program for the channel and may be overwritten during playback by events in a MIDI sequence. This method sets volume for the given channel. This method returns an array of all installed bank numbers. Each bank number is in the range of 0 to 16383. This method returns an array of programs defined in the given bank. Each program number is from 0 to 127. This method returns name of the specified program else it returns an empty string. This method returns name of the specified key, empty string or null if the key is not mapped to a sound. This method sends a short MIDI event to the device. This method returns the number of bytes actually sent to the device or -1 if an error has occurred. This Control increases or decreases the playback pitch of audio without changing the playback speed. This Control can be implemented in Players for both, MIDI media or sampled audio. It is not possible to set audible output to an absolute pitch value, it only raises or lowers pitch relative to the original. This method sets the relative pitch increase. This method returns the actual pitch increase in "milli-semitones". This method returns the current playback pitch raise in "milli-semitones". This method returns the maximum pitch raise in "milli-semitones". This method returns the minimum pitch raise in "milli-semitones". This Control controls the playback rate of a Player. The playback rate defines the relationship between the Player's media time and its TimeBase. The rates are in form of "milli- percentage". This method returns the actual rate set in "milli-percentage". This method returns the current playback rate in "milli-percentage". This method returns the maximum rate in "milli-percentage". This method returns the minimum rate in "milli-percentage". This Control controls the recording of media from a Player. It records the contents that are currently being played by the Player. This method sets the output stream where the data will be recorded. This method sets the output location where the data will be recorded. The locator has to be specified as a URL. This method returns the content type of the media. This method starts recording the media. This method stops recording the media. This method will not automatically stop the Player. This method only stops the recording. This method completes the current recording. This method returns the actual size limit set. This method erases the current recording. This interface allows one to specify a preset stop time for a Player. This field is returned by getStopTime if no stop-time is set. This method sets the media time at which you want the Player to stop. This method returns the current stop time in microseconds. This Control controls the tempo in musical terms of a song. This interface is typically implemented in Players for MIDI media. It is a basic functionality for a MIDI playback application. This method is used for setting the tempo. This method returns tempo that was actually set expressed in milli-beats per minute. This method returns current tempo expressed in milli-beats per minute. This interface enables the playback of a user-defined monotonic tone sequence. A tone sequence is can be defined as a list of tone-duration pairs and user-defined sequence blocks. This field defines the VERSION attribute tag. This field defines the TEMPO event tag. This field defines the RESOLUTION event tag. This field tells that a defined block should be played. This field defines the SET_VOLUME event tag. This field defines the REPEAT event tag. This field defines the Middle C.
This field defines the Silence. This method sets the user defined tone sequence. This Control controls the display of video. This is the control which offers the most futuristic Control of all the VideoControl. This defines a mode on how the video is displayed. It can only be used on platforms which support LCDUI. This method is used for initializing the mode for video display. This method sets the location of the video with respect to the canvas where the video is displayed. This method returns the X-coordinate of the video. This method returns the Y-coordinate of the video. This method shows or hides the video. This method resizes the video image. This method sets the size of the render region for the video clip to be fullscreen. This method returns the width of the source video. This method returns width of the display video. This method returns height of the display video. This method returns image in form of a byte array in required format of the displayed content. This Control is an interface for manipulating the audio volume of a Player. This method mutes or unmutes the Player associated with this VolumeControl. This method is used for setting the volume level of the Player. The volume should be set to a value from 0 to 100 on a linear scale. This method returns the level that was actually set. This method returns the current volume level or -1 in certain sittuations. This interface abstracts a single stream of media data. 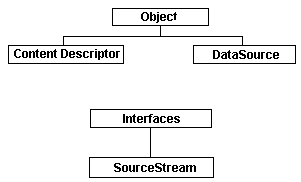 SourceStream is used in conjunction with DataSource to provide the input interface to a Player. This field defines the value which is returned by getSeekType method to indicate that this SourceStream is not seekable. This field defines the value which is returned by getSeekType method to indicate that this SourceStream can be seeked only to the beginning of the media stream. This field defines the value which is returned by getSeekType method to indicate that this SourceStream can be seeked anywhere within the media. This method returns the current ContentDescriptor for this stream. This method returns the content length in bytes. This method will return -1 if the length is not known. This method returns the total number of bytes read into the buffer. It may return -1 if the end of the stream has been reached. This method returns the minimum size of the buffer needed to read a "logical" chunk of data from the source. This method return’s -1 if the size cannot be determined. This method return’s the new stream position. This method returns the current position in the stream. This method returns an enumerated value to indicate the level of seekability. This class identifies media data containers. This constructor creates a content descriptor with the specified content type. This method returns the content type. This class is an abstract class. This class is an abstraction for media protocol-handlers. This class hides the details of how the data is read from source, whether the data is coming from a file, streaming server or proprietary delivery mechanism. This class also provides the methods for a Player to access the input data. This constructor constructs a DataSource from a locator. This method returns the locator for this source. This method returns the name that describes the media content. This method returns null if the content is unknown. This method opens a connection to the source described by the locator and initiate communication. This method closes the connection to the source described by the locator and free resources used to maintain the connection. This method initiates data transfer. This method stops the data transfer. This method returns the collection of streams for this source.